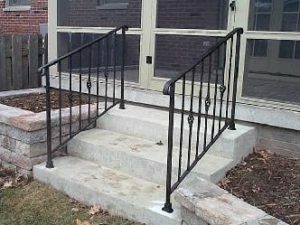 Wrought Iron Works, located in West Hartford, Ct produces ornamental iron works such as Stairways, Step Rails, Driveway gates, Iron Doors, Iron Fences, Railings and many more custom made products. Our commitment to excellence in every detail of the work we do has made us a leader in the industry. Our creative team works together to complete every project with the highest level of service and customer satisfaction. Our ornamental iron works production is not only artistic and beautiful but also built for endurance. A custom made iron product takes your home or business to a higher level and providing it with a luxurious look. We always stand behind our products 100%. Unlike wood or fiberglass or wood, Iron products will not split, warp or swell and are very easy to maintain. It also provides a more secure barrier for you and your family. All of our iron creations are design and built in our own facility located in West Hartford, CT. Once a quote has been provided either via e-mail or through a site visit and you are ready to get started then we are ready for the planning stage! Aside from their esthetic beauty, railings and handrails play important roles in protecting your safety and that of others. We consistently comply with building code bylaws and requirements while providing unparalleled quality. So, whether it’s for your home or business, let us protect you and those you love with iron work that is both sturdy, safe and beautiful. We are very proud of the craftsmanship and service that our company offers every customer. When our customer tells us that we have exceeded their expectations, then we know we have done our job. Wought Iron Works is quickly becoming the Connecticut leader in residential and commercial ornamental ironwork thanks to our innovative designs and professional customer service. Our company has a wealth of design options and choices available to our valued customers. From railings and gates to doors and fences, we are bound to have a design that suits your needs. Our options range from simple, clean lines to more ornate and ornamental pieces. Having this number of choices also means we have items to suit any budget! Let us put our many years of experience to work for you. Call today or visit our website and view our gallery of the many samples of ornamental iron works products that we can build for you. We also provide free estimates to customers, so you can review our prices before needing to make a decision. “Service, accountability, dependability. If there is anything wrong with our product we will fix it.